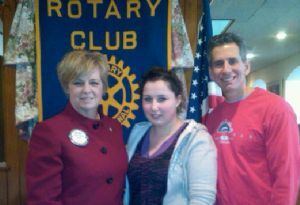 Inbound Youth Exchange Student, Lucille Touveron, spoke at the Rocky Point Rotary Meeting. Lucille is from Yutz France which is in the northeast Lorraine region of France. It is very close to both Germany and Luxembourg. Lucille's parents are educators. She has an older sister and a younger brother. Lucille has traveled to many European countries with her family. Lucille attends Shoreham Wading River High School. Lucille is pictured here with President Betsy Whitney and her counsleor Bob Badalian.